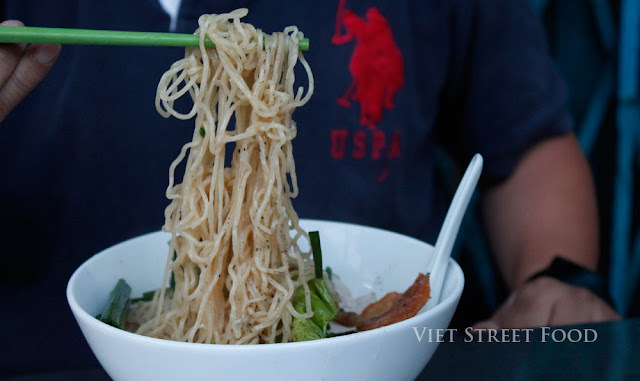 Not far from my place, there is one noodles stall, right in the corner between Hung Vuong and Le Hong Phong, how many times I pass by, always crowded. One evening, I tried to order some noodles takeaway, two waiters seemed so busy and ignored my order. I decided not to come back, never ever... until today. Today on the way back home with my old friend, having different thing in mind but when we passed by this noodles stall, I suddenly mentioned to my friend about what happening before, look at the stall, just opened, still empty. We decided to give it a try. Only typical Chinese noodles: yellow noodles and wonton. 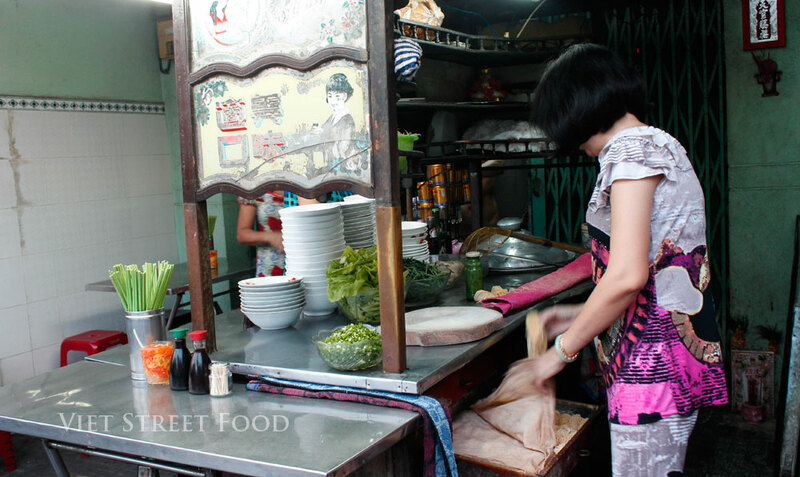 As many other stalls somewhere else in Saigon, they also have their own homemade noodles in a tiny wooden drawer - that could be one of their secrets to keep customers coming back. My friend ordered a "dry noodles" without soup, actually a small bowl of soup served separately. 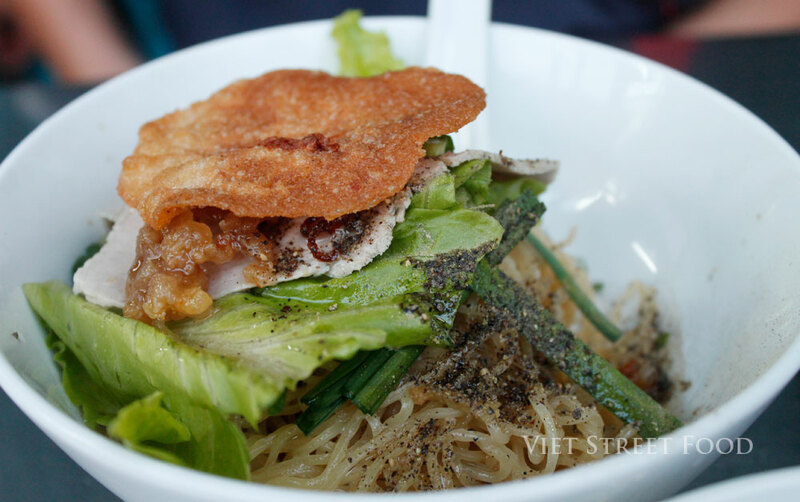 What I like is a thin, crispy, golden shrimp cake on the top, but not the crunchy pork rind (tóp mỡ - dried piece of fat). I didn't see this deep fried shrimp cake on top of noodles for long! My order - just a bowl of noodles with soup, we still want won-ton but not ready yet! Good and very surprisingly clear soup. I forgot to ask them not to add a spoon of fat, but it was too late! 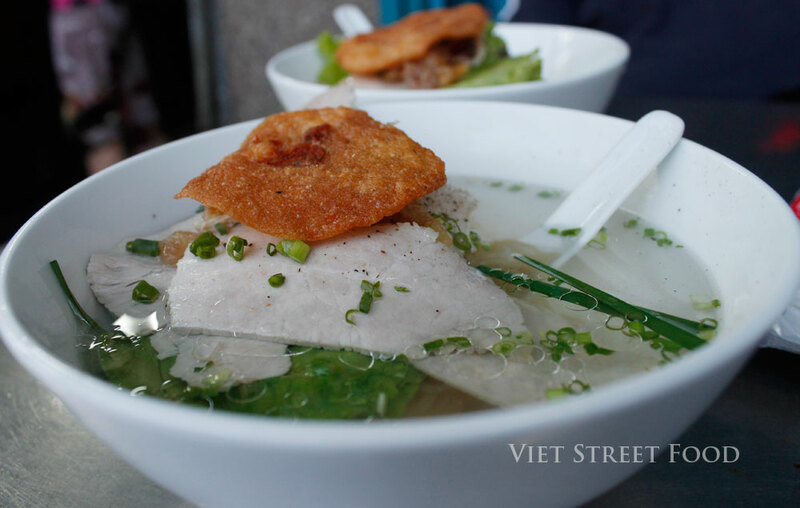 The soup is so clear as water, with some shining rings of fat, slices of cooked pork meat. Noodles here are good, not too soft, a bit strong as we expect. After we sat down, ordered, just few minutes later, all tables were quickly occupied, it was around only 5:00 pm at that time and they do business until late at night. Pickled chili, two bottles of black vinegar and soya sauce. No any veggies. I did have some posts about yellow noodles in my blog, here is a quick review of another traditional Chinese noodles stall in Saigon. I like the old cart, decorated with different characters from Chinese tale. 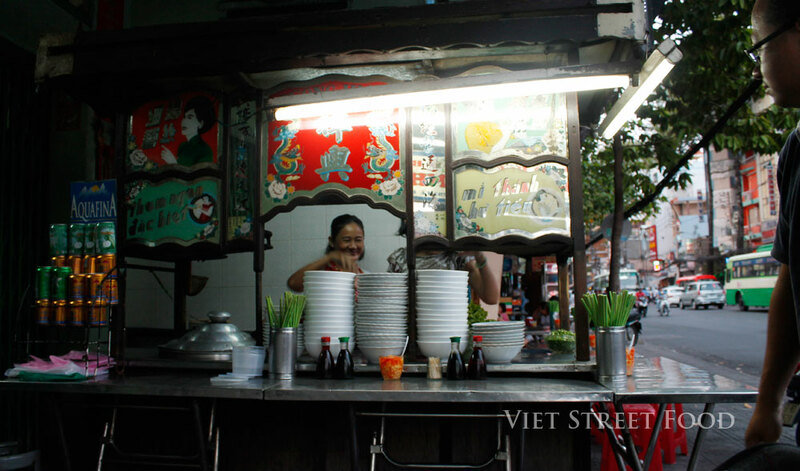 By the way, I heard there is a noodles stall near to Tân Định market, on Nguyen Huu Cau street, over hundred year old, a third-generation family business, still at the same place. Hope will share with you very soon. 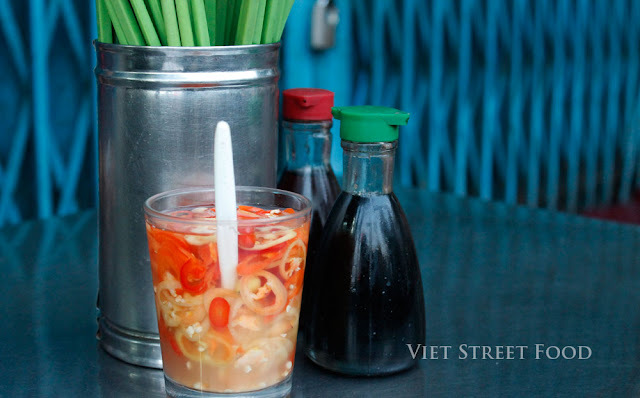 Chinese noodles stall at 297 Lê Hồng Phong, district 5, business hours from 17:00 to 23:00.